Trees purchased from nurseries are often delivered in a pot or container. 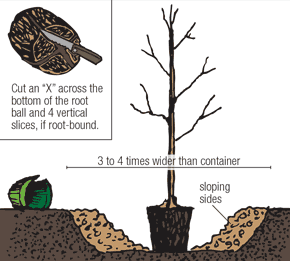 These instructions are for planting containerized trees. You can print these instructions to take with you. 4. Set the tree in the middle of the hole. Avoid planting the tree too deep. 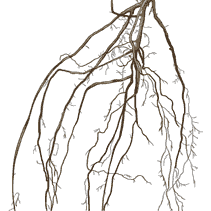 If the root collar sits below the top of the hole, compact some soil under the tree so that the root flare at the base of the trunk is slightly above ground level. 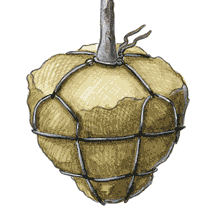 Using some soil, secure the tree in a straight position, then fill and firmly pack the hole with the original soil, making sure there aren't any air pockets. Keep backfilling until the soil is just below the root collar. Fertilizer? Do not use fertilizer, potting soil, or chemicals on your newly planted trees. Such products will kill your young trees.